On the Horizon — the academic journal on education policy and strategic planning — has just published has just published a special issue on the Knowmad Society and borderless work and eduction. The issue includes a paper of mine entitled Heavy switchers in translearning: from formal teaching to ubiquitous learning , which is quite a title indeed. Heavy switching is opposed to multitasking, in the sense that not only people do not actually multitask (increasing scientific evidence on that matter) but actually switch tasks very quickly and, more important, switch environments: their (formal) learning environment, their job environment, their family environment… When your environment is where your laptop is, people really can and actually do switch tasks quite heavily. Translearning is about learning through (instead of at) several places, learning as one goes along different environments and, above all, learning resources, especially those that are found outside of educational institutions. Thus, heavy switching and translearning are used in the sense that ICTs do transform the context and the environment where learning usually took place. And that is why Vygotsky’s Zone of Proximal Development is revisited, this time to redefine the more knowledgeable other in the framework of Personal Learning Environments. an interesting approach in blending Vygotsky’s zone of proximal development (ZPD) (see esp. Vygotsky 1978) with personal learning environments (PLEs), afforded through ICTs, that enable translearning and heavy switching that is difficult to manage in formal learning environments. In other words, PLE-based learning strategies could be employed to manage an individual’s engagement within their own ZPD. Such an approach, [the author] argues, blurs the distinctions between teachers and learners, in addition to questioning the roles of formal institutions of learning. The paper is still in its preprint version, so it may still go under some minor edits. I am very glad to see this paper published as its conception has been a gradual process of putting scattered ideas together since, as far as I can remember, my reflections after the Open EdTech Summit in November 2010. Most of them were tested live at TIES2012 in my communication The PLE as a personal tool for the researcher and the teacher . I am very grateful to John W. Moravec for his infinite patience, comments and hints way beyond his duties as guest editor. Purpose – We explore the role of Personal Learning Environments in an already ICT-dense context and in combination with some educational approaches in the field of technology enhanced education. We analyze how Personal Learning Environments are not a device but a learning strategy that threatens the way educational institutions and their functions are understood, by contributing to enable a borderless learning society. Design/methodology/approach – We will begin revisiting Vygotsky’s concept of the Zone of Proximal Development and assess the role of educators and educational institutions as the actual more knowledgeable others in scaffolding learners’ learning paths. This role will be put in relationship with different learning scenarios (formal, non-formal, informal and autodidactic) according to their inner structure (or lack of) and degree (or absence) of planning. Last, we put PLEs in relationship with other “physical” spaces (VLEs and LMSs), the digitization of content (open educational resources), records and assessments (e-Portfolios) and the possibility to flip some traditional tasks or processes that enabled regaining the social component in the classroom (Education 2.0). Findings – We suggest that PLEs have come to close the circle of ICTs in Education with a highly transformative power: the power to blur the boundaries between formal teaching and informal learning. Indeed, the traditionally difficult transition from one learning scenario to a different one has been made smoother by the appearance of OER and, especially, social media constructs that can be used for learning purposes, especially within a PLE-based strategy. Originality/value – It is stated that institutions should embrace and even foster the possibility that learners could easily and intensively switch educational resources, just like they could shift among different registers and learning scenarios, as a newly enabled way to tear down the artificial divisions that formal learning edified. Anderson, P. (2007). What is Web 2.0? Ideas, technologies and implications for education. JISC Technology and Standards Watch, Feb. 2007. Bristol: JISC. Journal of e-Learning and Knowledge Society, 3 (2). Rome: Società Italiana di e-Learning. Wales Wide Web, June 3rd, 2010. [online]: Pontydysgu. Educause Review, January/February 2008, 43 (1), 16–32. Boulder: Educause. Cobo Romaní, C. & Moravec, J.W. (2011). Aprendizaje Invisible. Hacia una nueva ecología de la educación. Barcelona: Laboratori de mitjans interactius. Publicacions i edicions de la Universitat de Barcelona. Educause Quarterly, 27 (4), 7-10. Boulder: Educause. Colley, H., Hodkinson, P. & Malcolm, J. (2002). Non-formal learning: mapping the conceptual terrain. A consultation report. Leeds: University of Leeds Lifelong Learning Institute. The Cambridge Companion to Vygotsky, Chapter 11, 276-303. New York: Cambridge University Press. 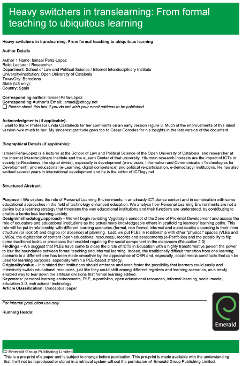 International Review of Research in Open and Distance Learning, 12 (1). Edmonton: Athabasca University. Franklin, T. & Van Harmelen, M. (2007). Web 2.0 for Learning and Teaching in Higher Education. London: The Observatory of Borderless Higher Education. Open Source for Education in Europe. Research & Practise, 163-168. Conference proceedings. Heerlen, the Netherlands, November 14 and 15, 2005. Heerlen: Open University of the Netherlands. Lorenzo, G. & Ittelson, J. (2005). An Overview of E-Portfolios. ELI Paper 1: 2005. Boulder: Educause Learning Initiative. UOC Papers, (3). Barcelona: UOC. Handbook of Research on Social Software and Developing Community Ontologies, Chapter XXVI, 400-414. Hershey: IGI Global. Revista de Universidad y Sociedad del Conocimiento (RUSC), Monograph: Framing the Digital Divide in Higher Education, 7 (1). Barcelona: UOC. Handbook of Research on Social Software and Developing Community Ontologies. Hershey: IGI Global. Roberts, G., Aalderink, W., Cook, J., Feijen, M., Harvey, J., Lee, S. & Wade, V.P. (2005). Reflective learning, future thinking: digital repositories, e-portfolios, informal learning and ubiquitous computing. Briefings from the ALT/SURF/ILTA Spring Conference Research Seminar. Dublin: Trinity College. Informations, Savoirs, Décisions, Médiations, (25), art.348. La Garde: Université du Sud Toulon-Var. Shirky, C. (2008). Here comes everybody. How change happens when people come together. London: Penguin Books. the encyclopaedia of informal education. London: YMCA George Williams College, London. Wales Wide Web, October 1st, 2009. [online]: Pontydysgu. Vygotsky, L. (1991). A formação social da mente. São Paulo: Livraria Martins FontesEditora Ltda..
Vygotsky, L. (2001). Pensamento e Linguagem. São Paulo: Ridendo Castigat Mores.